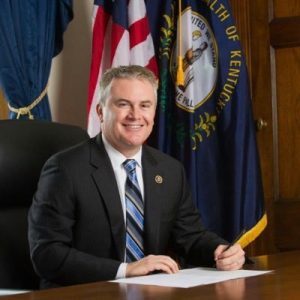 (Paducah, KY, August 2, 2017) – First District Congressman James Comer will be the featured speaker for the Paducah Area Chamber of Commerce Public Policy Luncheon on Thursday, August 17. The event, sponsored by Four Rivers Nuclear Partnership and Swift & Staley, will be held at Walker Hall Events Center, 229 Madison Street in Paducah, beginning at 11:30 a.m. The Paducah Chamber’s Public Policy Series gives the business community access to legislative leaders, issues and information. Congressman Comer was elected to Congress in November of 2016. He grew up in rural Monroe County and graduated from Western Kentucky University where he studied his life long passion of agriculture. Prior to his election to Congress, he served as Kentucky’s Commissioner of Agriculture having been elected in 2011. He also served six terms as a member of the Kentucky State House, where he was lauded for his success as a legislator and was named the National Republican Freshman Legislator of the Year during his first term. Congressman Comer is a fierce advocate for rebuilding our nation’s infrastructure, balancing the federal budget, and implementing business-friendly policies, including regulatory reform. These are his chief priorities in the 115th Congress. Comer is married to TJ Comer, and father to Reagan, 12, Harlan, 9, and Aniston, 5. In addition to providing an update on the top issues before Congress, Congressman Comer will spend time answering questions pertinent to the business community in the area. The cost is $20 and open to the public. Those interested in attending should register on line, www.paducahchamber.org, email info@paducahchamber.org or call 270-443- 1746. The deadline to register is August 14.